Enjoy the quick benefits of smiling and the benefits of laughter. You will experience more positive energy, self-confidence and high self-esteem. Repeated smiling helps to reduce stress, enhance happiness and improve the quality of your personal life and the lives of people around you. Smile Reminder is easy to use. Download and boost your happiness. Why is Smile Reminder good for me? Smiling activates the happy chemicals in your brain. Studies show that smiling helps to lower stress, increase self-confidence, boost happiness and it may be beneficial for people struggling with anxiety and depression. When you smile to yourself you instantly change the brain's chemistry. Smiling releases powerful neurotransmitters like dopamine, endorphins and serotonin. Serotonin deficiency is a common contributor to mood problems. Dopamine, endorphins and serotonin are the happy drugs. You can trigger these powerful neurotransmitters intentionally when you smile. The benefits of smiling and the benefits of laughter are amazing. Each time you smile to yourself you break the patterns of your thoughts for a moment. Repeated smiling helps you to break patterns of negative thinking dozens of times every day. The ability to consistently break patterns of negative thinking at any time, diminishes the power negative thinking has over you. Smiling also helps you to freely change the way you think by initiating positive thoughts. Keep smiling, you are now the boss. Smiling opens new doors of opportunity that previously were closed. Look at babies, they smile around 400 times a day, (a smile every 2 minutes). Adults who smile 50 times a day, (a smile every 15 minutes) are generally happy. Adults who smile under 20 times a day, (one smile per hour) are generally unhappy. Turn on the app by turning the switch on. Tap on the “gear” icon on the bottom right of your screen to open settings menu. 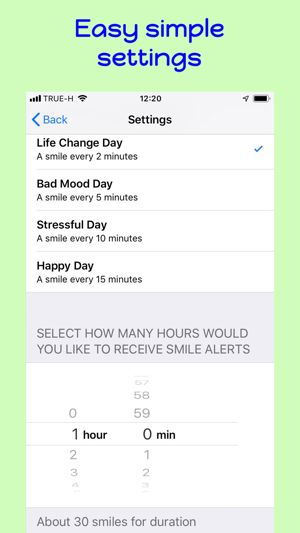 Select a smile frequency (how often do you want to smile each hour) and select how many hours would you like to receive smile alerts. You can choose from 10 smile reminder sounds. It is that simple! You can stop the smile alerts at any time by turning off the app. At the end of the smile duration you will receive the following notification: “End of smile period. Launch smile reminder Again”. Press OK to turn off the app. Happy Day - 4 smile reminders per hour, a smile every 15 minutes, around 50 smiles a day. 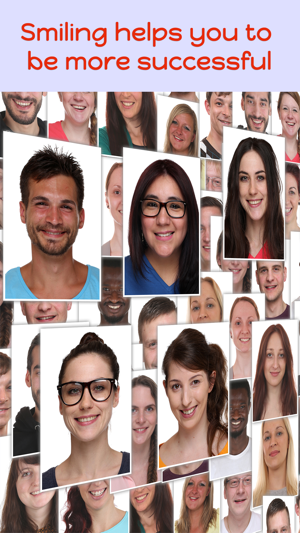 Statistics show that people who smile around 50 smiles a day are generally happy. Stressful Day - 6 smile reminders per hour: a smile every 10 minutes, around 80 smiles a day. De-stress and have nice day. Bad Mood Day- 12 smile reminders per hour: a smile every 5 minutes, around 150 smiles a day. De-stress and have a beautiful day. Life Change Day - 30 smile reminders per hour: a smile every 2 minutes, around 400 smiles a day. That is how many times babies smile. This setting helps to overcome many mental barriers. De-stress and have a magical day. Everything that you do starts with a thought, repeated smiling helps you to think more positively. You may ask yourself, how can I smile more? The answer we offer is Smile Reminder. How easily we forget to express happiness in our day to day lives, when just smiling can effect and change our whole mood! 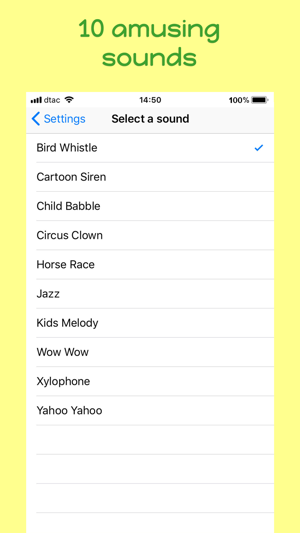 The app is extremely simple and has some funny sound tones too, and the best part is there is no ads and you don’t even have to be on your phone! 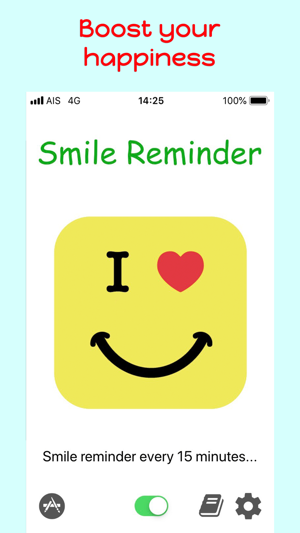 A great app that uses funny sound reminders to remind me to smile without having to look at my screen. Brilliant! I love the “life change” smile frequency settings. After 4 hours of being reminded to smile every 2 minutes, I feel so much more relaxed and positive. I also appreciate that there are no ads.